Welcome to Abuelita Mexican Foods. Abuelita started when Eugene Suarez, Sr. and Eugene Suarez, Jr. produced their first corn tortilla on June 3, 1971 in a tiny tortilla factory in Herndon, Virginia. From these humble beginnings grew a company with a 36,000 square foot facility and over 60 employees based in Manassas Park, Virginia. The classic 6-inch corn tortilla was the first product; inspired by the cooking and recipes of Carmen – the matriarch of the Suarez family and the inspiration of Abuelita. Whole kernel corn cooked in small batches, then ground with traditional lava stones, create the great taste and texture of truly authentic corn tortillas. Now the Suarez’ have expanded the product line and offer custom pack services. The original process is still the fundamental basis for all of the corn tortillas and tortilla chips. Today, Abuelita offers the classic tortilla, plus a complete line of flour tortillas, flavored tortilla wraps, and tortilla chips. We have been in the market longer than our competitors and have proven brand name recognition. ABUELITA is the name for quality Mexican foods. 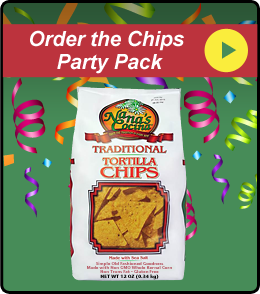 Our Nana’s Cocina and Abuelita tortilla chips are available in retail stores throughout the United States.